The prohibition of alcohol in the United States during the early 20th century didn’t really affect the nightclubbing scene in Los Angeles, California, especially in the Culver City area during the 1920s. Sebastian’s Cotton Club, at the intersection of Washington Boulevard and National Street, was the leading and most popular jazz club in Culver City, and in the greater Los Angeles metropolitan area. 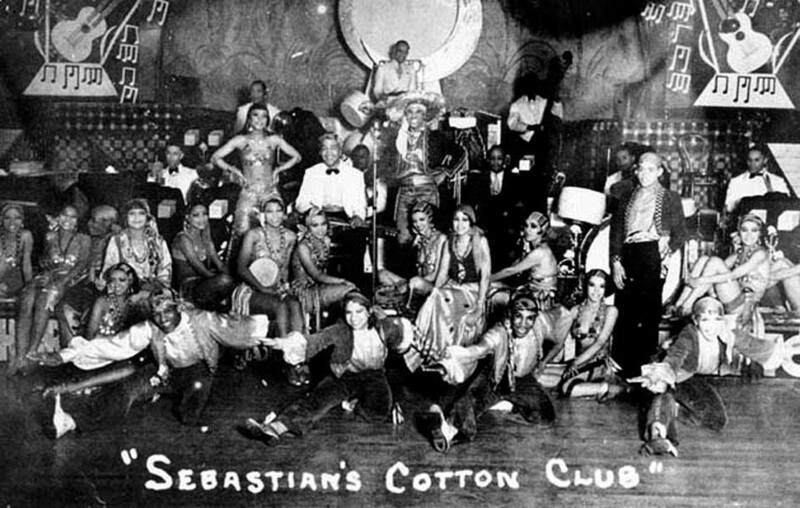 The club was opened by Frank Sebastian in 1926, hence the name “Sebastian’s Cotton Club” was influenced by the famous Cotton Club in Harlem. The building was built in 1923, formerly known as “The Green Mill,” the largest entertainment emporium in the Los Angeles area, before Frank Sebastian purchased the building for his own business. Frank Sebastian was already a prominent entertainment businessman in Los Angeles having owned one other prominent and successful establishment: Sebastian’s Café, also known as Venice Café due to its location being near Venice Beach. What made Sebastian’s Cotton club ahead of its time was the fact that it was one of the very first jazz clubs to play exclusively all-black bands and orchestras. One of the famous acts that performed at Sebastian’s Cotton Club was the very well-known Louis Armstrong Band which became famous for its number “I’m a Ding Dong Daddy.” Although other prominent jazz musicians played at the Cotton Club, Armstrong’s Band is the only group that created a live recording while performing there. Because it was a nightclub outside the city limits of Los Angeles and not affected by the city-wide curfew of 2:00 a.m., it was open all night. Frank Sebastian issued a challenge: if a patron off the Cotton Club made it through the entire night at the nighclub, he or she was served a free eggs-and-ham breakfast in the morning. Despite its success through both the late 1920s and the early Depression era, the Cotton Club shut down in 1938. It was reborn months later under a new name, “Casa Manaña,” and became a successful dance venue during World War II. After another change in ownership in the post-war period, “Casa Manaña,” was converted into the “Zucca Opera House,” which ultimately burned down in 1950. Devon McReynolds in Arts & Entertainment, LAist, Jan. 27, 2016; Devon McReynolds, "Vintage Photos From Culver City's Lively Prohibition-Era Jazz Scene,." Laist. (January. 2016), http://laist.com/2016/01/27/culver_city_jazz_scene.php#photo-1; Martin Turnbull, "Frank Sebastian’s Cotton Club – Corner National and Washington, Culver City." The Garden of Allah Novels during Hollywood's Golden Years. April 2016, https://martinturnbull.com/2014/05/23/frank-sebastians-cotton-club-corner-national-and-washington-culver-city/. Devon McReynolds in Arts & Entertainment, LAist, Jan. 27, 2016; Devon McReynolds, “Vintage Photos From Culver City’s Lively Prohibition-Era Jazz Scene,.” Laist. (January. 2016), http://laist.com/2016/01/27/culver_city_jazz_scene.php#photo-1; Martin Turnbull, “Frank Sebastian’s Cotton Club – Corner National and Washington, Culver City.” The Garden of Allah Novels during Hollywood’s Golden Years. April 2016, https://martinturnbull.com/2014/05/23/frank-sebastians-cotton-club-corner-national-and-washington-culver-city/.